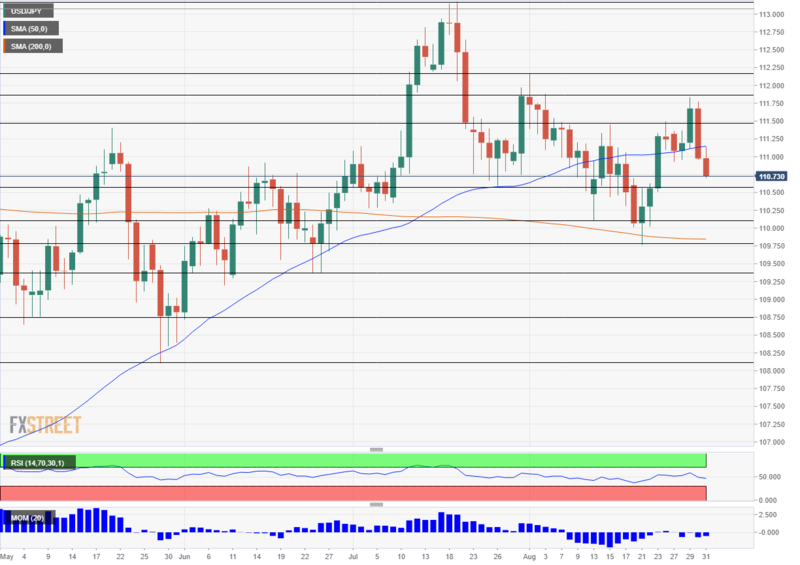 The USD/JPY wobbled amid a NAFTA breakthrough, Brexit optimism, emerging market trouble, and Trump’s threats. Substantial US tariffs on China and the Non-Farm Payrolls are eyed. The charts show the pair leaning slightly lower. Political developments had the broadest impact on currencies, overshadowing economic data. The week began with the US and Mexico announcing a deal to replace the NAFTA deal from the 1990s. Canada is set to join soon. The news sent markets higher and reduced demand for the safe-haven yen. Another positive development came on the Brexit front. Chief EU Negotiator Michel Barnier said the EU is ready to offer the UK “a deal like no other.” The USD/JPY enjoyed another rally. Also, emerging market emerged to the news once again. Argentina asked to accelerate the IMF bailout and exacerbated the situation. The Turkish Lira resumed its falls after the local holiday. The stronger US Dollar, a result of the Fed’s hikes and trade wars is taking its toll on the most vulnerable countries. The Japanese Yen receives safe-haven flows in these events. US Q2 GDP enjoyed an upgrade to 4.2% annualized, better than expected. However, US housing data continues disappointing. All in all, the USD/JPY is a barometer of the global mood, rising and falling on trade and political developments, alongside stocks. The US is due to conclude its preparations for new duties on China on September 6th. The plan is to slap the world’s second-largest with duties on no less than $200 billion worth of goods, a severe escalation in comparison with the recent levies worth $50 billion. China is set to retaliate with tariffs on $60 billion of US goods and perhaps with additional steps against US companies operating in China. There is still a chance to postpone the move, and that would provide a sigh of relief. Going ahead with the tariffs will deal a blow to the global economy. Trade headlines are set to dominate the scene. Significant economic indicators also await the greenback in the first week of September. The ISM Manufacturing PMI kicks off the week, serving as the first hint towards the Non-Farm Payrolls. Another drop in the headline and the Prices Paid component (eyed by the Fed) is due. 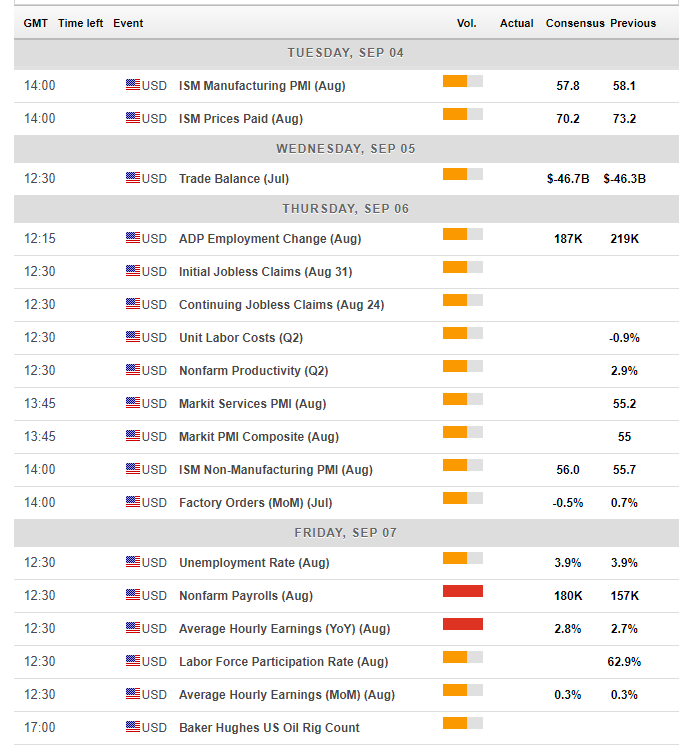 The trade balance is on the docket for Wednesday, and a busy Thursday awaits markets. The ADP Non-Farm Payrolls serve as a substantial hint for the Non-Farm Payrolls, and it is expected to be somewhat softer. The ISM Non-Manufacturing PMI, which dropped sharply in July, will also be of interest. The primary indicator is the Non-Farm Payrolls report. Back in July, the US gained only 157,000 positions, below expectations. A more considerable increase of 180,000 is forecast for August. Wages are expected to rise by 0.3% MoM once again and to see an acceleration from 2.7% to 2.8% YoY. This is the last jobs report before the Fed convenes later in September and is set to raise rates. The Japanese Yen moves with global stock markets more than anything else. An upbeat market mood pushes stocks higher, and the pair advances with them. Fear and a risk-off mood do the opposite. Apart from the US-Chinese trade spat mentioned earlier, the denuclearization of North Korea should be watched as well. Talks have not made any progress of late. Japanese economic indicators worth noting are foreign investments and household spending, with the latter expected to drop once again. The Bank of Japan is set to continue its loose monetary policy for a long time. The USD/JPY dropped below the 50-day Simple Moving Average and Momentum is slightly leaning to the downside. At the moment, the Relative Strength Index is around 50, balanced. 110.55 provided support in late July. Further down, 110.10 was a swing low in mid-August. 109.75 was the trough of August and it is backed up by the 200-day SMA. Lower, 108.30 was a low point in late June. On the topside, we find 111.40 which held the pair down twice during August. 111.75 follows closely: it was the peak late in the month. 1112.15 was a swing high on August 1st. 113.15 was a peak back in July. If the US moves forward with the considerable escalation in trade wars, it is hard to see how market optimism prevails. A downturn in stocks could carry the USD/JPY down. An upbeat jobs report is unlikely to help. The downside seems more appealing.